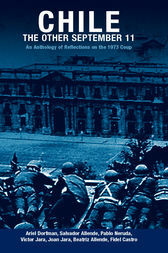 This anthology reclaims the tragic date of September 11 as the anniversary of the US-backed coup in Chile in 1973 by General Augusto Pinochet against the popularly elected Allende government. The selection combines moving personal accounts with a political/historical overview of the coup’s significance, featuring Ariel Dorfman's poignant essay, The last September 11” and President Allende's last radio broadcast. * Ariel Dorfman is a renowned Chilean author. Editors Pilar Aguilera and Ricardo Fredes are young Chileans who now live in Australia. .